Once a week, I am in charge of an arts and crafts class with the year one students. 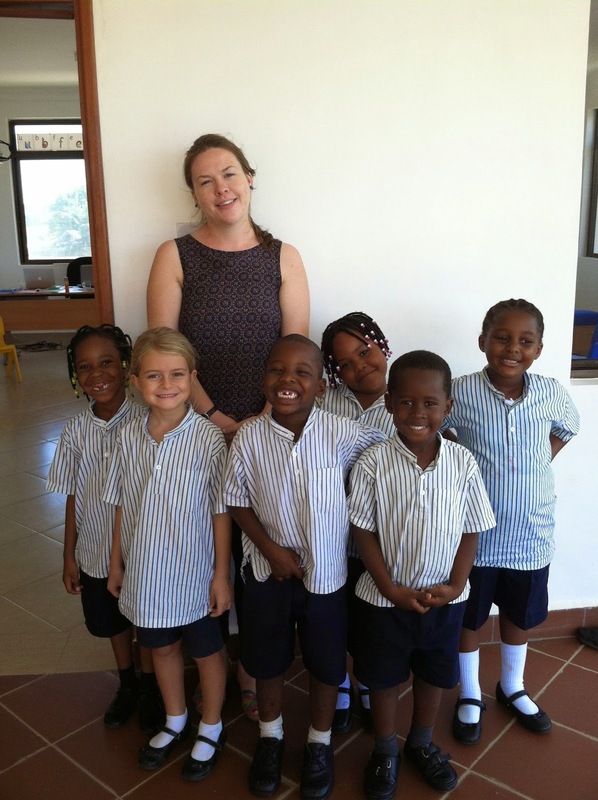 In the USA, these would be kindergarteners. 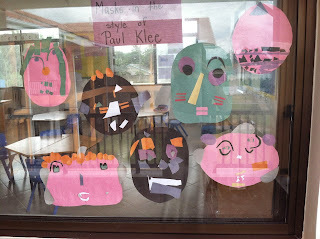 The first week, I had the bright idea of making masks based on the art of Paul Klee. We cut out tiny scraps of paper to glue on the geometric masks. Hello? Nancy? Our un-air conditioned classrooms have ceiling fans and open windows bringing in monsoon breezes. The air flow scattered the scraps to the far corners of the earth. It was a total disaster. The second week, I closed all the windows and shut off the ceiling fans. We completed the masks in a 100 degree heat index (breeze free) classroom. Paul Klee would be proud of the results. Paul Klee masks displayed on the window of my class. First, we painted the brown trunks. Brown paint was smeared on paper, clothing, and hands. Next, we dipped our sponges into the green paint to make the leaves. After the papers were saturated with paint, I thought we should take a break to let the masterpieces dry before adding the apples. The students and I trooped down the stairs to the sink with our paint crusted brushes, sponges, and hands. After rinsing off the first layer, I sent the students to the girls’ and boys’ bathrooms to wash off the remainders of paint. All of a sudden, the girls returned tattling on Monyadia. “She washed her hands in the toilet!” the girls shouted. “They wouldn’t let me use the sink!” Monyadia wailed. “Wash your hands with extra soap!” I replied. As we re-entered the classroom, I told the children that we needed to be paint detectives. Paint had dropped on the floor and we needed to find it. Could the children find the paint so we could wipe it up? We walked into the class, looking for paint drippings. “There!” Mary shouted triumphantly. I bent down to wipe up the paint. BAM! Jonah’s head crashed into mine. I stood up in disbelief. “What happened?” I asked. “She pushed me!” Jonah pointed to Monyadia. “Monyadia, what happened?” I asked. “He wasn’t looking at the floor!” Monyadia explained. “Was that a good choice? Should we ever push?” I asked and quickly cleaned up the puddles of paint. 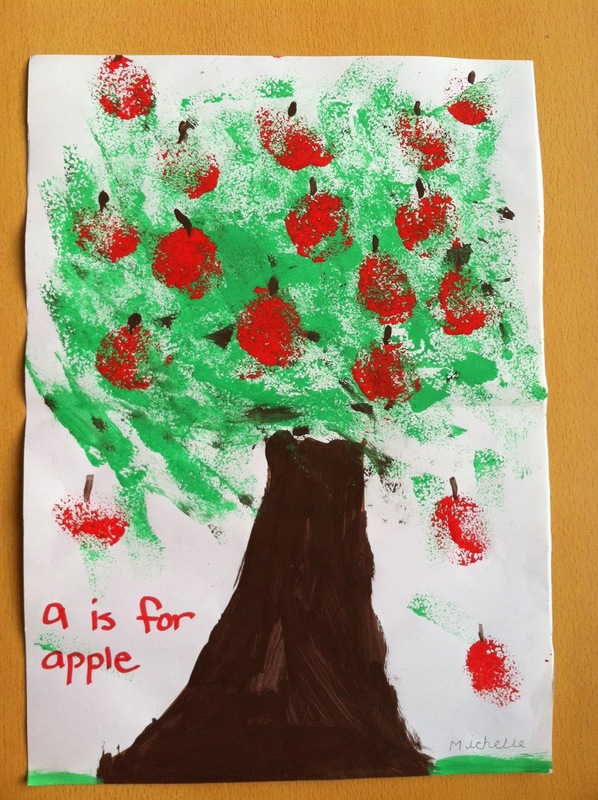 The students began to stamp red circle apples on the trees. I looked over at Jonah. He was coating his hands in red paint with his sponge as he sucked on the end of his apron string. All my teaching career, I have praised my fellow teachers who teach first grade or kindergarten. Now I can say, without one shred of doubt, they are saints who are guaranteed entrance to heaven with unlimited chocolate martinis throughout eternity. Our saintly year one teacher and my arts and crafts students.